Believe it or not, I only learned to apply makeup a few years ago. Well, I needed to put something on my face because of my previous job as a magazine editor. I used to go barefaced to events and the brand managers just never recognized me because in the magazine, my photo showed a gorgeous girl. In real life, with no makeup, I'm, well, I'm not ugly, but let's just say the girl in the photos did not look anything like the girl at the events trying to convince the brand people that I'm kinda somebody hahaha. I knew that cleansing the skin of all traces of makeup was essential so that skin won't get damaged. However, since I wore makeup maybe once or twice a week, I never invested in makeup removers. I figured a good scrubbing with facial cleanser was enough. I guess that's why I was still so pimply. I also read in InStyle that if you wear sunscreen, which I do, you'll still need makeup remover. So for today's Topaz Beauty, I'm going to talk about my makeup removers! I had used Shu Uemura's cleansing oils before. They do an excellent job but I really didn't like massaging oil into my face. So I did a lot of research on makeup removers. I wanted the best! 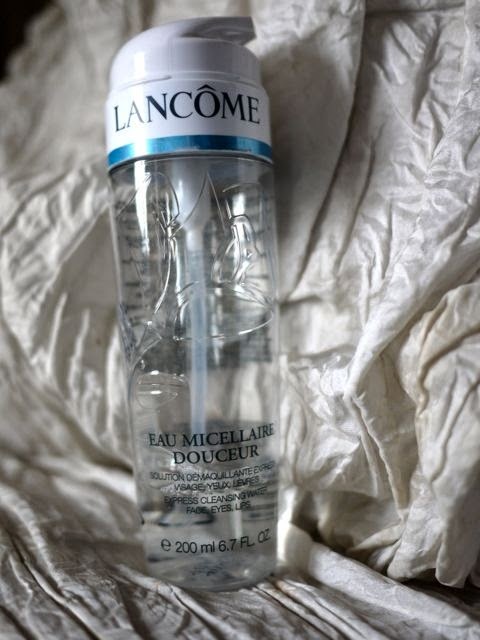 Beauty review site Makeup Alley gave Lancôme's Eau Micellaire Douceur Express Cleansing Water for Face, Eyes and Lips 4.3 stars. The only reason why it's not 5 stars is because it's so expensive. It was only when I read an interview with Emma Watson that I was convinced. 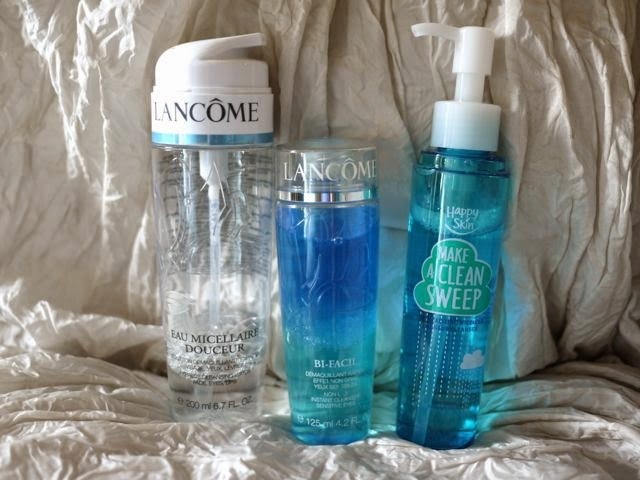 She said that Lancôme's makeup removers are the very best and that they remove every bit of makeup that's applied on her during movie shoots and photo shoots. Since I adore Emma, I got myself Lancôme's Eau Micellaire Douceur! You know what? This Micellaire water really works. My skin is really clean. Not squeaky dry clean, but nice and soft and fresh clean. And I don't have pimples anymore! That up there is my current bottle. There's just an inch of it left. I kinda don't want to buy a new bottle because it's not cheap (it's P1,795) and I'm a freelance writer now and my clients haven't paid me yet (hello, magbayad na kayo!). At the same time, because it works naman talaga, the cost isn't really that much. I guess I'm just being a cheapskate now because I'm about to give birth haha. So thank goodness for Happy Skin!!! Happy Skin Make A Clean Sweep Revitalizing Micellar Makeup Cleanser (Php 599) has the exact same powerful ingredient as Lancome's—the Micellar water! Plus, it has anti-inflammatory Japanese tea extract and anti-oxidant Lotus Seed extract. The cleanser really does remove every bit of makeup but it's so nice on the skin. You just swipe here and there and makeup melts away. No need for tugging or pressure. It smells nice, too, not overpowering or strong. You also just need one pump (well, I do since I don't apply a lot of makeup) so this will last a long time. Super sulit at just P599! 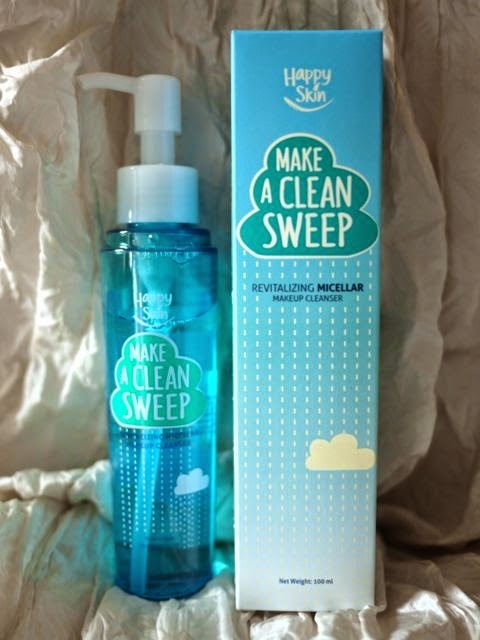 My only con with the Make A Clean Sweep cleanser is it stung my eyes. I know it's supposed to be a gentle cleanser that you can use even for eye makeup but when I pressed the soaked cotton pads onto my eyes, it stung. Hindi naman namula or na-irritate ang mata ko, nasaktan lang. When I read other reviews online, the bloggers didn't have the same reaction naman so maybe ako lang ito. Anyway, to remove my eye makeup, I went back to Lancôme. 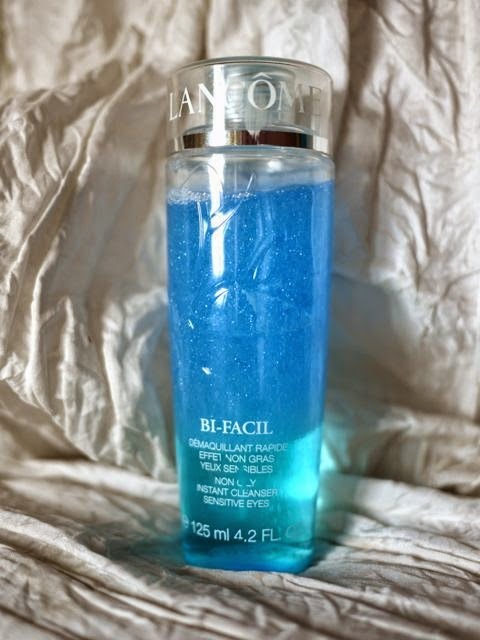 I'm using the Bi-Facil Double Action Eye Makeup Remover now. I found it in my beauty products drawer. It's a freebie. Again, I did some research and this is a winner of many beauty awards. You have to shake the bottle to mix the two phases—the lipid phase removes makeup while the water phase refreshes and conditions skin. There's no stinging and no oily residue. It's opthalmologist-tested so it's safe for the sensitive skin around the eyes. Also safe for contact lens wearers like me. Best of all, it really does remove every bit of eye makeup, even liquid liners and waterproof mascara, in one swipe. I love it! The only con with Bi-Facil? It's also pricey. I don't know how much it costs here in Manila, but according to the US website, it's $28. That's P1,141. So if I use this and Happy Skin, that's a total of P1,740. So it's basically the same price as the Lancôme Eau Micellaire Douceur! Lancôme is available at Greenbelt 5, Essences Power Plant, and at Rustan's Dept. Stores in Makati, Shangri-la Plaza and Alabang. Happy Skin is available at Rustan's Makati, Rustan's Shangri-la, Beauty Bar and select Plains & Prints boutiques. Visit www.happyskincosmetics.com to check out their other fun and skin-caring products. Shu Uemura is great! It's sulit also kasi even though it's expensive, the bottle is huge naman so it lasts forever. Why do you want to change it?